An artist rendering of the proposed Bluewater Grill restaurant at the end of the Newport Pier on the Balboa Peninsula. 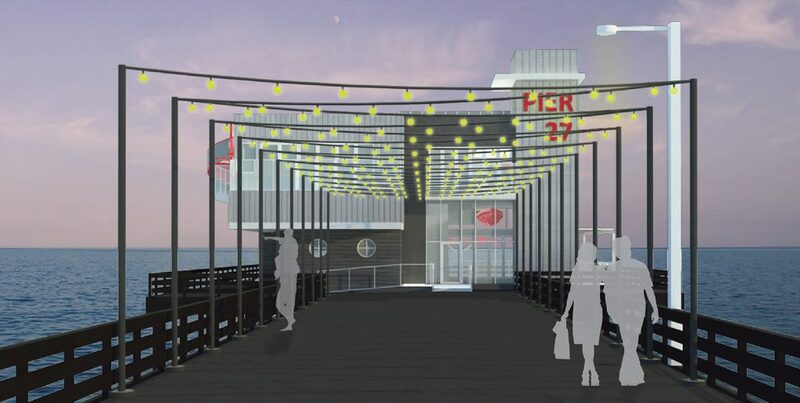 Plans for a proposed restaurant at the end of Newport Pier will soon head to statewide authorities after city officials gave the go-ahead this week to seek a permit on the project. On Tuesday, Newport Beach City Council authorized staff to submit a Coastal Development Permit to the California Coastal Commission for the proposed Bluewater Grill restaurant project at the end of the Newport Pier. The item was included in the consent calendar and was approved 7-0 with no discussion. 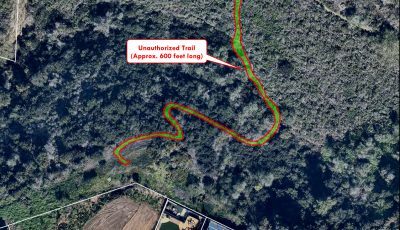 Acquiring the Coastal Development Permit could take between nine to 12 months, so city staff wanted to start the process as early as possible. Council entered into an agreement with James Ulcickas and Richard Staunton, owners of Bluewater Grill, in March for the project located at 1 Newport Pier on the Balboa Peninsula, near 21st Street and West Oceanfront. The city-owned property at the end of the pier has been vacant since the previous lease expired in late 2012, when the Newport Pier Grill & Sushi Bar closed after many years at the site. 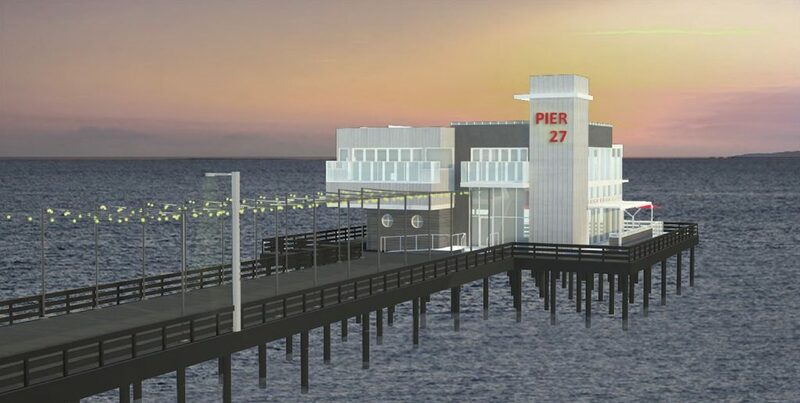 “After evaluating the existing structure and the underlying pier, it was determined the building is beyond its useful life and its removal and replacement is the best economic option,” the staff report explains. The project consists of demolishing the existing two-story, 4,000-square-foot building – which was built in the 1940’s and renovated in the 1980s – and constructing a new building that will also be two stories, but slightly bigger at 4,500 square feet. Open outdoor dining and a takeout window will also be included. Also on Tuesday’s consent calendar, the Council decided to dissolve the Tidelands Management Committee. The Committee’s duties will be referred to the Harbor Commission. In 2013, Council directed the Tidelands group to focus on a number of issues, including: Making recommendations to the City Council as to the components, prioritization, and implementation of the Tidelands Capital Plan; and making recommendations to Council as to large tidelands capital needs. “Staff believes that much of the work of the TMC – especially as it relates to important capital projects such as sea walls and dredging – is more aligned with, and duplicative of the role and duties of the Harbor Commission.,” staff explains in the report. Merging the committee’s duties with the Harbor Commission will reduce duplication, costs, and improve efficiency, according to city staff. 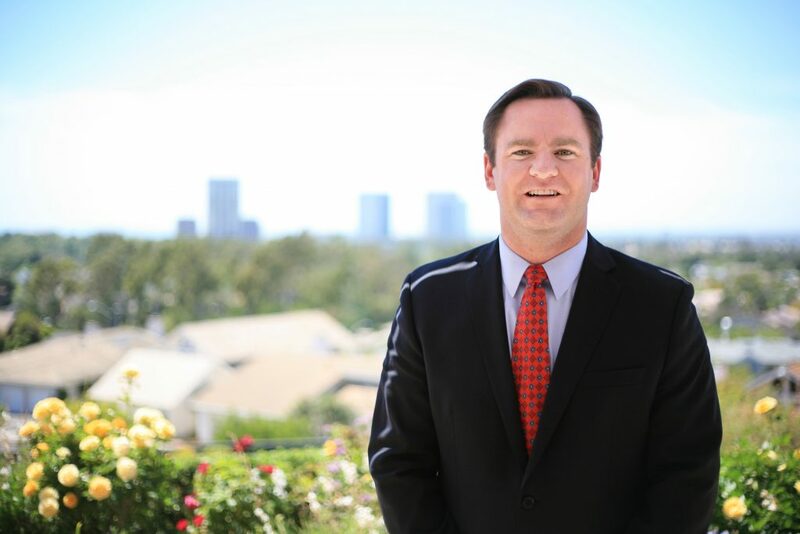 Tuesday also saw Council newcomer Will O’Neill moving forward with his first plan of action. O’Neill asked to place an item on a future agenda that would have the Council consider creating a subcommittee to track and update the Council on policy D-3, review of the Council Policy Manual. Policy D-3 requires the Council to go through the council policies at the beginning of each year, O’Neill explained. There are certain policies that could make some government functions more efficient, O’Neill told the Indy previously. “Our Council Policies also need a fresh look with an eye toward streamlining government functions and decreasing bureaucracy,” O’Neill said earlier in January. The suggestion only needed three affirmative votes of support, which it got when all seven council members raised their hands in approval. City watchdog Jim Mosher commended O’Neill for his interest in the city’s policy manual. “It’s very good to see the council actively looking at their own policies,” Mosher said. The subcommittee would last three to six months.